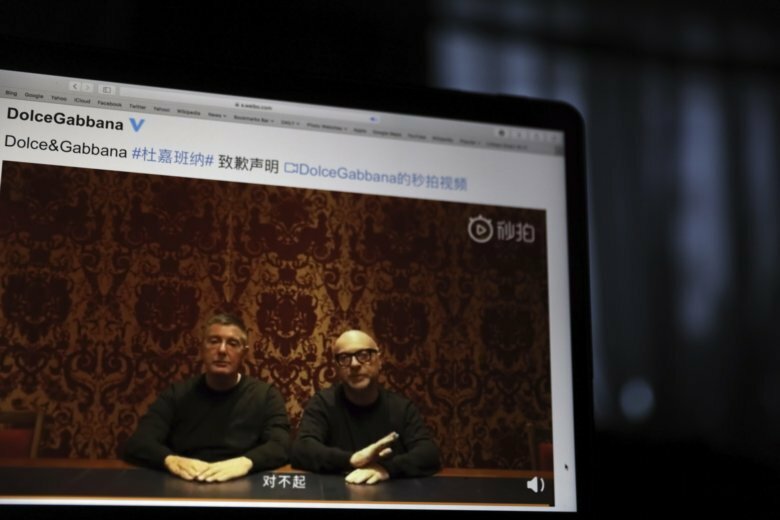 BEIJING (AP) — The co-founders of Dolce&Gabbana apologized Friday in a video on Chinese social media after promotional videos seen as racist and subsequent Instagram messages stoked a furor in one of the world’s largest markets for luxury goods. Domenico Dolce and Steffano Gabbana appeared in a nearly 1 ½ minute video posted on Weibo, a Chinese version of Twitter, saying they hope to be forgiven and will do their best to better understand and respect Chinese culture. The Italian fashion house has been in hot water for the videos and subsequent insulting remarks made by the Instagram accounts of both the company and Gabbana. It blamed hackers for the Instagram comments. In the apology video, the two designers wore black long-sleeve shirts, the kind they often wear to runway shows, and sat with their hands folded at a large conference table in a room decorated with formal, red-gilded wallpaper. They finish the video by saying “sorry” in Chinese. The backlash forced Dolce&Gabbana to cancel a major extravaganza earlier this week that the company had billed as one of its biggest shows ever outside of Italy. Chinese purchases at home and abroad account for about 30 percent of global luxury goods sales. Several screenshots showed Gabbana’s Instagram account referring to China with crude terms and emoji as he defended the promotional videos. Zhang Ziyi, who starred in “Crouching Tiger, Hidden Dragon,” said on one of her social media accounts that the Italian brand had “disgraced itself.” Chinese pop idol Karry Wang and actress Dilireba, both Asia-Pacific brand ambassadors, have informed the company that they will terminate all cooperation. The fallout spread to Hong Kong on Friday with upscale department store Lane Crawford joining Chinese retailers who stopped selling Dolce&Gabbana merchandise. “With respect to our customers, we have removed the brand from all stores in mainland China, online and in Hong Kong,” Lane Crawford President Andrew Keith said in a statement. Dolce&Gabbana goods earlier disappeared from major Chinese e-commerce sites including Alibaba’s Tmall and JD.com. A duty-free shop at the Haikou Meilan airport on China’s Hainan island announced on social media that it had pulled all the company’s products.